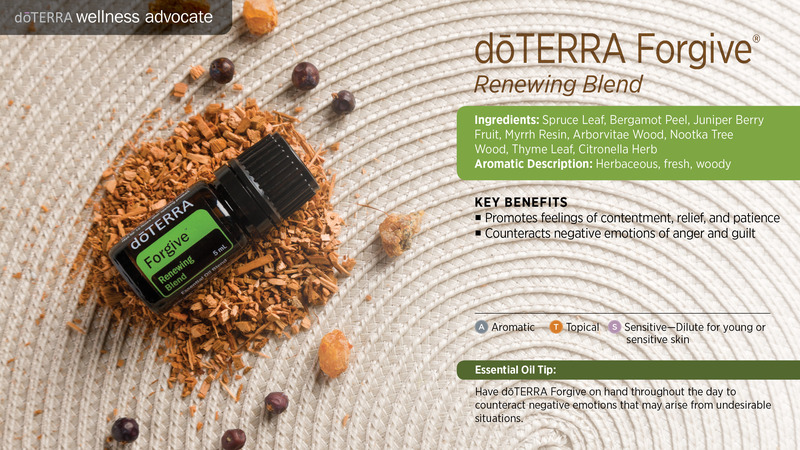 The fresh, woody aroma of doTERRA Forgive Renewing Blend helps to counteract emotions of anger and guilt, while promoting the liberating feelings of contentment, relief, and patience. Are you carrying a burden that grows heavier with time? Would you be better off just letting it go and facing a future unfettered by anger and guilt? When you are ready to move forward, doTERRA Forgive Renewing Blend of tree and herb essential oils will help you discover the liberating action of forgiving, forgetting, and moving on. Start each of your tomorrows relieved and contented with Forgive Renewing Blend. Diffuse when meditating to help release harboring feelings of anger and guilt. Apply to pulse points and heart throughout the day to feel grounded and content. Have doTERRA Forgive on hand throughout the day to counteract negative emotions that may arise from undesirable situations.